As soon as kids attain the school going age, mothers get surrounded with loads of concern. And the one among all happens to be preparing the child's tiffin box. Apparently, the kids mid-morning snack i.e. between 10-11 am, not just needs to be filling but healthy as well. You can't always send them a packet of Uncle-chips, Kurkure, or for that matter cheese decked sandwiches. However, making healthy as well as tasty snacks for kids can always be challenging for the mom as she won't want to see the tiffin coming back without the content inside being touched. 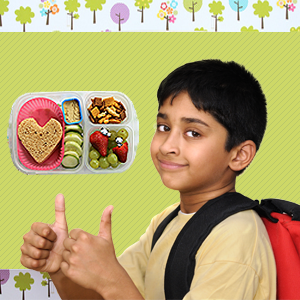 An empty lunchbox is what satisfies a mother, who wants her child to eat healthy and grow healthy. Well, if you are also a mom worried about the healthy snacks for kids to be packed for school lunchbox, then check out these healthy snack ideas. Snacks for kids must be a healthy combination protein, foods with natural sugar such as fruits and complex carbohydrates. You must give them foods that are nutritiously healthy, energy rich and easy to digest. Ensure you give them variety of grains as they are rich in all vital nutrients. Though wheat and rice are very common, you can even try ragi flour, oats etc. Limit the intake of packaged food as they only taste good but lack in nutritious value. However, treating them to a bowl of maggi or packet of Lays once in a while is not harmful. Idli Fry: You can either use the fresh ones or the remaining lot kept in the fridge. Just break them into small pieces and cook with some finely chopped veggies. Limit the use of oil and spices. Rich with vegetables, this dish will surely delight your kids. Mini idlis: You will have to get the mini idli mould for these. They not just have a cute appearance but when served with mint or coconut chutney, can render delectable taste. Boiled Corn: Boiled corns not just satisfy the hunger but can even be tasty if cooked with some chaat masala. Roasted Corn: For a change, you can even roast the corn with some light spices and and pop them in the lunchbox. Club Vegetable Sandwich: Add layers of whole wheat or whole grain bread and make a small club vegetable sandwich. Deck it with mint chutney or little butter. Veg Parathas: Stuff the flattened whole wheat dough with some finely cooked veggies. You can experiment with the shapes like square or triangle. Aloo Parathas: They are the all time favorites and a healthy as well as filling choice. If you want, you can serve them with little sauce for a different taste. Masala sprouts cooked with some minced tomatoes and onions can be quite filling and healthy snacks for kids. Cook the pasta with some tomato sauce prepared at home. If you want, you can even opt for plain boiled pasta with grated cheese. Cut short the dosa size and stick to the mini version. Also, instead of the regular flour, try the ragi flour for some added nutrition. You can keep on experimenting with the daily menu and prepare something innovative every time. Also, if at times you run short of time, choose the healthy snack options like nuts, whole grain biscuits, wheat flakes etc. Don't just stuff the lunchbox with the same kind of food or packaged items. Prepare a tiffin box that's healthy, tasty and fresh!